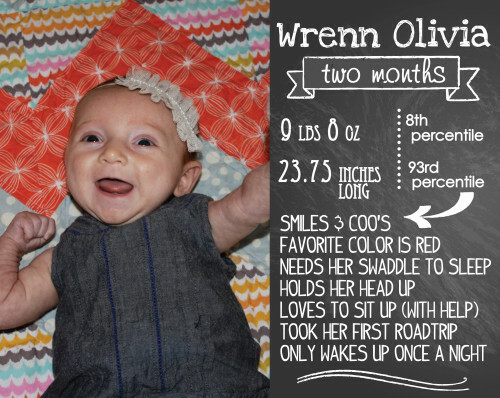 ***Note: Wrenn turned two months old on September 10, but I went back to work two days later, and am just now getting around to posting this because all I want to do in the evenings if come home and snuggle my baby girl. Her photo is from the two month mark and it’s amazing how much she has changed since then! Stay tuned in a few days for her three month post! You are definitely a morning person. You have fallen into a routine of going to bed between 7:30 and 8:00 and waking up at 7:00 each morning. Most nights you only wake up once, which has been a treat for your mama. You still love to be swaddled and it’s the only way you’ll sleep in your crib, but it works like a charm. You’re such a talker already. It makes sense, seeing as both your daddy and me are quite gabby. You talk and coo and have long conversations with me, smiling and singing. You have the sweetest little high-pitched voice. Sometimes I’ll repeat your coos back at you, and you smile like you think it’s so funny. I love our little conversations. We took you on two road trips during your second month – the first to a family lake house – just the three of us – in Oklahoma, and the second to Midland to celebrate the birthdays of cousins Ella and Jack. You are a good traveler, sleeping most of the way. But packing for a baby – oh my goodness, you require a LOT of luggage! Your daddy and I love to travel and we can’t wait to show you the world. You still have colic, which made for some tough moments this month, mostly because as your mama I hate to watch you suffer. Toward the end of the month things improved a little, and in the meantime we continue to give you Mommy’s Bliss Gripe Water after every feeding and try our best to console you as you cry. I can’t wait for you to feel better. Your favorite color is red. You get so excited when you see something red from across the room and get a big smile on your face and stare intently. I’ll admit sometimes I wear a red shirt just because I know you’ll like it. 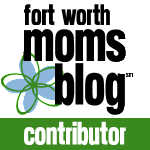 You love to sit up like a big girl – with our help, of course – and can hold your head up for long periods of time. You don’t like to be cuddled up to our shoulder – no, you like to see what’s going on around you. I have a feeling you’re going to be quite social as you grow up. You’re becoming more observant. You love to lie on the floor under this toy/play-thing and kick at the toys dangling above you. You don’t yet know what to do with your hands, but those little feet of yours have great aim. You are a wiggly little thing. You’re still long and lean. You started the month in preemie clothes and finally got too long for those and graduated to newborn clothes. Even though you’re a skinny little thing, you’re a great eater and the doctor says you’re quite healthy, which we are so thankful for. And you have the biggest eyes I’ve ever seen on a baby – everybody who meets you comments on how beautiful they are, and how alert you are. I could stare at them for hours. I got to stay home with you again this month and went back to work just a few days after your two month birthday. This second month was so much easier – we seemed to know each other better, I was able to anticipate your needs better, and I just loved getting to play with you, cuddle you, and tote you around. You are such a fun addition to our little family. Sometimes your daddy and I look at each other and wonder how God could have chosen us to be parents of someone so wonderful. Baby girl, you are a delight and an answer to my prayers. It is an honor to be your mama. 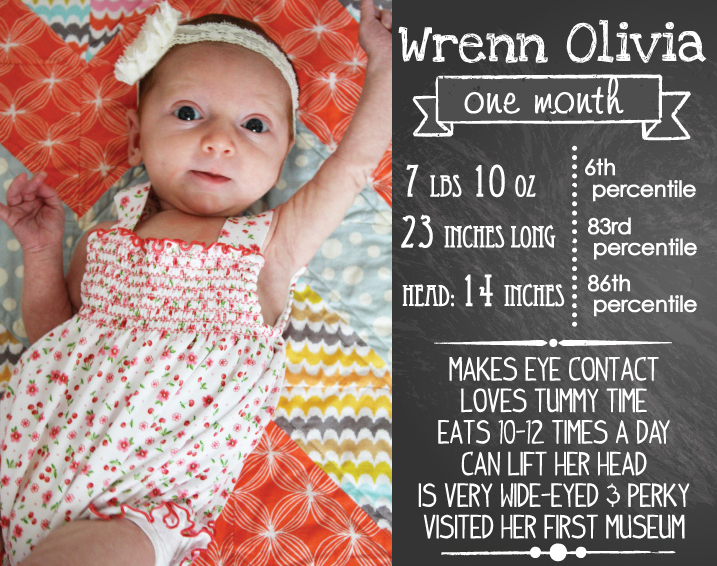 I love you, Wrenn Olivia! Next Post → Shop Update & 30,000 Hits!